SC contacted me for help finishing her husband's home office. She had started the process 9 months ago with another designer, but it needed a bit more work before it was done. "I have existing office furniture and that's it.....I need rug, chairs, window treatments -- and anything else you can think of. The space joins a playroom - so things have to coordinate." She was off to a great start with beautiful black office furniture from Ballard Designs and the walls painted Benjamin Moore's Nimbus Gray. 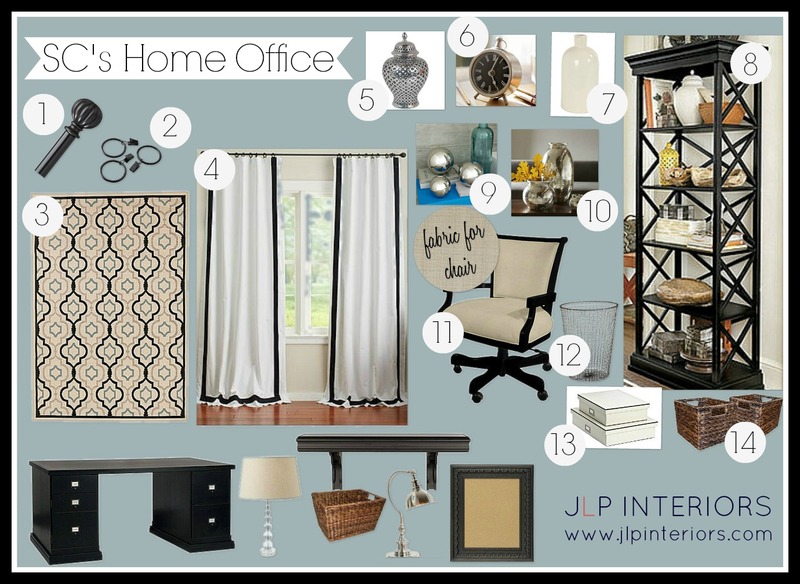 We agreed that my Custom Mood Board service would work best for her since she already had most of the "big pieces" and didn't need help with a floor plan or furniture placement. Working with the beautiful Ballard office furniture, lamps, baskets, and shelving SC already had, I suggested a few new pieces to finish the room. I chose a new bookcase to take the place of an industrial style filing cabinet and picked out some accessories and baskets to fill the shelves. I also made suggestions for a new rug, window panels, and office chairs and gave SC some direction to pull the room together. It'll be beautiful! I love the rug! Pretty! I have to second Amy, love that rug! Thanks ladies! I love the rug too! It's an indoor/outdoor rug so will hopefully hold up well.